find verb (found , finding) 1 to discover through search, enquiry, mental effort or chance. 2 to seek out and provide something  I'll find you a plumber. 3 to realize or discover something. 4 to experience something as being (easy, difficult, etc)  find it hard to express oneself. 5 to consider; to think. 6 to get or experience  find pleasure in reading. 7 to become aware of something or someone  found her beside him. 8 to succeed in getting (time, courage, money, etc for something). 9 to see or come across  a bird found only in Madagascar. 10 to reach  find one's best form. 11 tr & intr, law said of a jury or court, etc: to decide on and deliver a specified verdict about (an accused person)  found the accused innocent  found that the accused was guilty  found a verdict of guilty. noun something or someone that is found; an important discovery. all found with food and housing provided. find it in oneself or in one's heart to be prepared (to do something hurtful, etc). find oneself to find the role, etc that satisfies one. find oneself doing something to discover or realize that one is doing it  found themselves agreeing. find one's feet to establish oneself confidently in a new situation. find out about something to discover or get information about it. find someone out to detect them in wrongdoing; to discover the truth about them. found1 verb (founded, founding) 1 to start or establish (an organization, institution, city, etc), often with a provision for future funding. 2 to lay the foundation of (a building). ETYMOLOGY: 13c: from Latin fundare, from fundus bottom or foundation. found2 verb (founded, founding) 1 to cast (metal or glass) by melting and pouring it into a mould. 2 to produce (articles) by this method. founding noun. See also foundry. ETYMOLOGY: 14c: from Latin fundere to pour. found3 past tense, past participle of find. all found see under all. “Chambers is the one I keep at my right hand”- Philip Pullman. 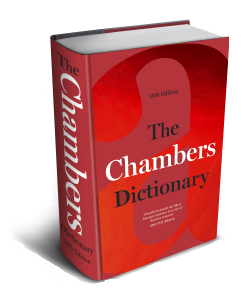 The unrivalled dictionary for word lovers, now in its 13th edition. 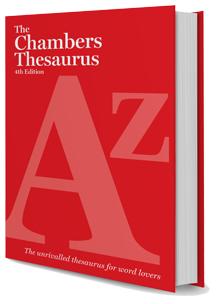 The Chambers Thesaurus (4th Edition) is a veritable treasure-trove, including the greatest selection of alternative words and phrases available in an A to Z format. “Simply all you need to know about anyone” – Fay Weldon. 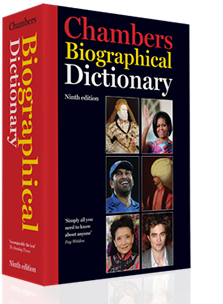 Thoroughly revised and updated for its 9th edition.